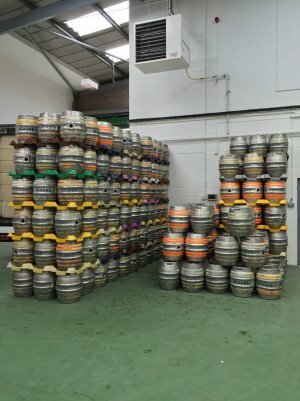 Cloudwater Brew is a new brewery in Manchester. Co-founders Paul Jones and James Campbell required a significant amount of flooring work and associated drainage to be carried out in order to get the Piccadilly Trading Estate site ready for its launch in April 2015. Kemtile was asked to fit a tiled brewery floor, and a platform upon which Cloudwater Brew could position its steam boiler. The company was also asked to come up with a new flooring solution for the warehouse floor where the existing floor was giving poor anti-slip performance. Kemtile fitted the tiled floor using the market-leading Kagetec BS System, incorporating Argelith MVTec 18mm thick, fully vitrified, hexagon ceramic floor tiles, with 1:50 run off to drain and bund wall around the perimeter. We then installed a heavy-duty polyurethane screed with a matt-textured finish on the warehouse floor to deliver the best possible slip resistance and durability. Paul Jones, co-founder of Cloudwater Brew, said:"I'm afraid our industry is filled with horror stories of poorly performing floors, and empty promises. Kemtile gave us complete confidence that we'd end up with the flooring we had in mind, and avoid the woes of a poor install." "We chose Kemtile because of its reputation and vast experience in the field, as well as the professional and helpful manner in which they dealt with setting up our job. We are completely happy with the work they did for us."